For this week I have the theme Snacking all the way under Kids Delight. Well since we dont have any small kids at home I have chosen recipes which are for a little older kids , so these have some spice in them. The same recipes could be followed for the younger ones without extra spice. 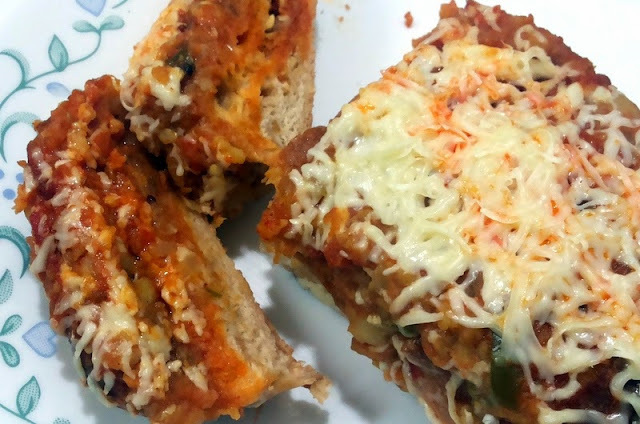 The first dish is a Pav Bhaji Loaf. This is what my son makes for himself when I make Pav Bhaji. At times he wants to change the form of this street food and give it that conti look. Here he has used the same laadi Pav and bhaji that we normally make with those buns. The transformation is amazing. Take two pavs, both should be joined to each other. Make two slits in each Pav and one slit on the joint. Make sure you do not cut them through . Apply butter in between the slits. Next apply some garlic chutney in the same slits. Using a spoon fill in the slits with the Pav bhaji sabzi. Wrap this loaf in a foil and bake in a hot oven for 10 minutes. Remove the foil carefully and enjoy.